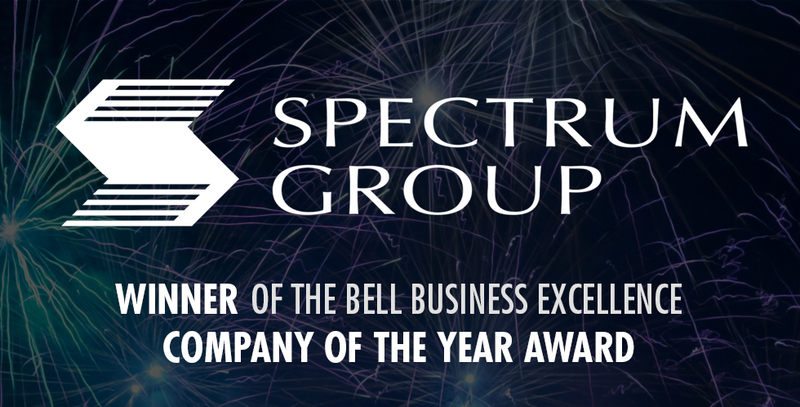 We are very proud to announce that Spectrum Telecom has received the award for COMPANY OF THE YEAR 2017 at the Bell Business Excellence Awards. For twenty years the Sudbury Chamber of Commerce along with Bell have been recognizing local businesses and entrepreneurs that have helped shape the city. The format of the ceremony has changed a little. For the past two years 3 finalists have been selected for each category and the winner is revealed at the awards gala. Awards are given to successful local entrepreneurs and businesses for both their contribution to the local economy and their dedicated community involvement. Sponsored by the Northern Life and Northern Ontario Business, for Company of the Year, the finalists were: Spectrum Telecom Group, Belanger Ford Lincoln and Crosstown Chevrolet. The chamber received over 100 nominations and essays and Spectrum Telecom was selected as the top 3 in the category of ‘Company of the Year’. At the awards Gala the finalists were introduced with a short video clip and like the Oscars, the winner was then revealed. It all started with a nomination from RBC due to the strong performance and year over year growth that Spectrum has demonstrated under the new ownership. The original founders of Spectrum Telecom retired in 2014 and sold their interest in the company to the management team of Geoffrey Hatton, Darren Schankula and Jason Bionda. Building on a reputable company, the new owners have been growing and investing in their technology business with significant results. Spectrum Telecom was originally established in 1992 as a Motorola dealer. Shortly thereafter it was expanded to 6 locations in Northern Ontario. We have held our position amongst the top 10 Motorola dealers in Canada for the past 25 years. As technology has evolved so have we, in 2007 we established our internet company, Netspectrum, and it has grown exponentially over the years. Netspectrum now provides Internet to thousands of customers in rural communities. The reliability of our network is built with products from leading manufacturers such as Cisco, Mikrotik, Cambium and Nutanix. We maintain some of the largest private communication networks in the province for public safety and utilities. Our two-way radio business has grown over the years and we operate our own Motorola digital PTT (push to talk) network across Northern Ontario. We provide 24/7 support for mission critical public safety communication systems for all the major municipalities in Northern Ontario. To better service our contracts and customers, in 2016 we purchased a telecommunications tower company. The company is based in Orillia and our team specialises in the construction, rigging and maintenance of cellular, radio and communication towers throughout the province. In 2015, we were awarded with the top award from Motorola for sales performance, the highly coveted Empower Circle award. In 2016 we were recognised as being amongst the top 5 employers in Northern Ontario, for which we were nominated by our employees. This year, Spectrum Telecom will be investing and expanding our market for our Netspectrum Internet Services. We will continue to invest in our digital PTT network (TalkPlus) and we will be offering the latest communication software and products such as PTT over cellular, PTT over WiFi and productivity applications. We can say with confidence that the future looks great for Spectrum Telecom. This award for Company of the Year is a direct result of having employees that our dedicated to their work and who demonstrate a high level of customer service. It is to our employees that we dedicate this award.